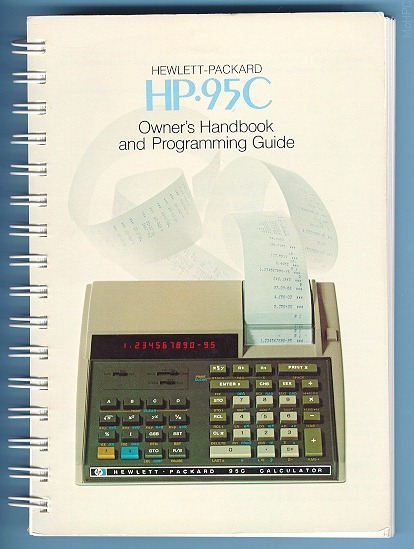 The HP-95C was one of the later 90 series calculators meant to be introduced in 1977. After an initial production run of fifty or a hundred units (recollections vary), HP abandoned the model and it was never sold to the public. Most of the units were rounded up and destroyed but the one pictured below hid in a desk drawer at HP for twenty years before coming to the museum. Apparently HP decided that the price of the 95C was too close to that of the HP-97 and that the latter's magnetic card reader was more compelling than the HP-95C's continuous memory and "partitions" (see below). Two years later, the HP-41C appeared with continuous memory as the primary storage and with partitions in a slightly altered form. Perhaps the HP-95C was simply ahead of its time. The HP-95C had 200 fully merged program steps (multiple keystrokes took one step) and 17 registers labeled 0-9, .0-.5 and I. The programming model was quite sophisticated including label addressing, 3 levels of subroutines, indirect addressing and program step insertion and deletion. 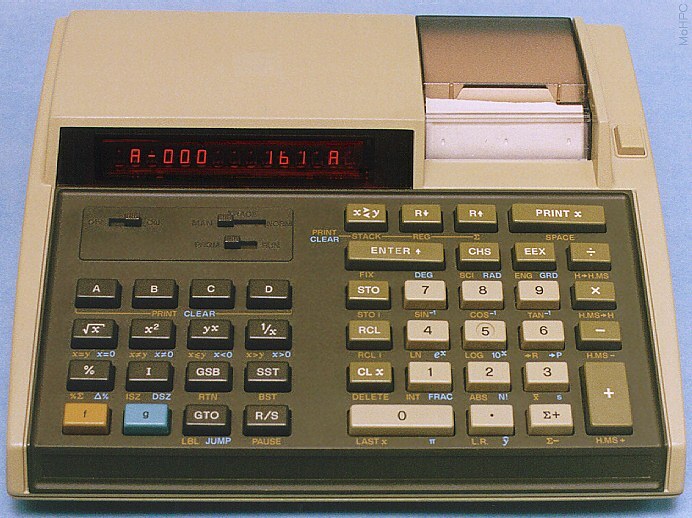 The HP-95C was the first calculator to feature "Partition Programming". While unusual in name, Partition Programming was quite similar to the programming model later found in the HP-41C. The calculator had four partitions A, B, C, and D with corresponding keys. Each partition was essentially a global label that was always present in the calculator's memory. Pressing one the keys A-D started execution at the top of that partition. The "partitions" were, of course, completely variable in size because the calculator had automatic insertion and deletion of instructions which automatically moved the partition labels. Like previous high-end calculators, the HP-95C came with a way to label the keys A-D. A small (non-magnetic) "program card" could be labeled and then slipped into a clear card which fit above and around the top row of keys. So far, Partitions sound a lot like the labels of the earlier calculators. What made them different was that the labels 0-9 were local to a partition. Thus each program A-D, could have labels 0-9 that were independent of the same labels in other partitions. This allowed the user to safely load multiple independent programs. Partitions also lead to other conveniences. For example, the user could print or clear individual partitions. If the user wanted power rather than safety, HP provided a mechanism to circumvent the "localness" of labels 0-9. The JUMP instruction took a partition letter followed by a local label number. For example, JUMP B 6 would jump to label 6 in partition B. It was even possible to call a local label in another partition by executing a GSB to a JUMP instruction. The RTN in the subroutine would return to the instruction after the GSB since the JUMP didn't affect the return stack. Indirect addressing gave the calculator, true computer power. Once a value was stored in the I register, it could be used to control store and recall addresses via the STO i and RCL i instructions. Values could be stored in I with the STO I instruction and could be recalled by pressing RCL I or simply I which made I a convenient scratch pad register as well. ISZ and DSZ instructions incremented or decremented the I register and skipped the next instruction if I was 0. 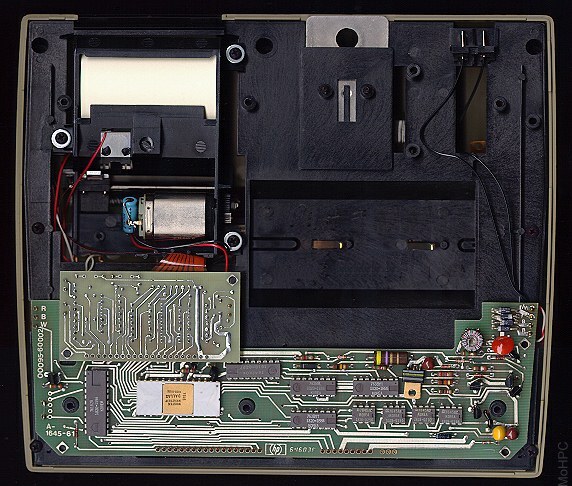 Like other 90 series machines, the HP-95C was based mainly on the same technology used in the 20 series. It also featured the 90 series battery-powered printer that could print the display, the stack, programs etc. It could also be used in trace mode to debug programs. "Having had quite enough of the frigid winters of Alaska, rugged frontiersman Natty Bumppo is driving his 1959 Edsel the length of North and Central America to the relatively sunny climate of Brazil. In the course of his journey, Bumppo wishes to be able to read distance markers and calculate how long it will take him to reach the next town. He can read his speed in miles per hour from the Edsel's speedometer, but he knows that some of the distance markers will be in miles and some in kilometers." "Howdy! This is your HP-95C Applications Book, your introduction to real world programs written in a number of fields including mathematics, statistics, finance, surveying, navigation and games." The HP-95C also had more preprogrammed functions. The HP-95C was definitely not a printing HP-25C. Picture of an HP-95C (~110K) The calculator is in program mode.